Set against the backdrop of North Carolina’s powerful hog-producing industry, Justice by Another Name tells the story of Paul Reavis’s suspicious workplace death followed a year later by a senseless death of his young son Paulie. Lana Reavis, who believes her husband was murdered and her son the victim of deliberate negligence, enlists the aid of her long-ago boyfriend, Will Moser, who is currently chief deputy of Hogg County and the heir apparent to the local sheriff. As Will’s investigation unfolds, suspicious activities and cover-ups begin to emerge. All evidence points to Oris Martin, the powerful owner of Martin Farms, a huge hog-production enterprise and Hogg County’s largest employer, as the mastermind. Despite political pressure and physical threats to look the other way, Will continues his search for what really happened. Meanwhile, Lana, convinced that Oris will be beyond the reach of justice, devises a plan to avenge her family and destroy everything precious to Oris Martin. 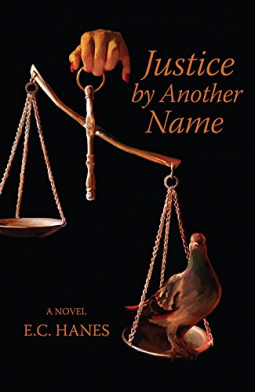 I had no idea when I downloaded the ARC of this book from NetGalley just how much I was going to enjoy Justice by Another Name. I had never heard of E C Hanes and had no expectations that a murder in the hog-producing industry would be so enthralling. But as soon as I began reading I had a feeling that this was going to be a good book. It has a dramatic opening as two boys, Paulie Reavis and Hank Grier are playing in Mitchell Creek in Hogg County, North Carolina. There’d been a violent storm and water was pouring down the creek sweeping huge tree trunks and other debris with it. At the top they saw a gigantic whirlpool and were taken by surprise when the lagoon of hog waste from Oris Martin’s farm above the creek burst through its retaining wall. Five million gallons of putrid black hog faeces and urine flooded down the gulley, taking the boys with it. Hank, survives, although badly injured, but Paulie dies. Imagine the horror of drowning in pig waste! From that point on I was fascinated by the investigations into Paulie’s death and into the death of Paul, his father, a year earlier. Paul had worked on Martin’s pig farm and Lana, his wife is convinced his death was not an accident. I was just as fascinated by the details of the pig farming, the conditions the pigs are kept in, the diseases they carry and how the pig waste is dealt with, the whole process of constructing and operating the lagoons. The mystery is not just how they met their deaths, but why. Was Paulie’s death an accident, a result of the storm damage or has someone been negligent? Was his father’s death really an accident? And just what caused the hog cholera epidemic that had hit the Martin Farms? My thanks to the author, the publishers and NetGalley for my copy of this book. Wow. That would be an awful way to die. I don’t know much about hog farming, but do know that there are feral hogs in abundance running wild in Texas. There was a big herd of them in our area (and our backyard) a year or so ago. They do a lot of damage and are a bit scary. This one sounds really intriguing, Margaret. And it sounds as though there’s a solid sense of place and context, too, which, to me, always add much to a book. Very glad you enjoyed this.